The Copper Cabin is another hand peeled and scribed Bozeman log cabin. 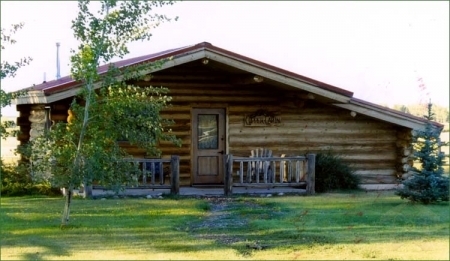 This Montana cabin is a slightly larger vacation rentals than the Silver Creek Cabin having a separate bedroom with a queen size bed and two single beds. Copper Cabin vacation rental features a nice bath with a huge shower; fully equipped kitchen w/a full-size stove, refrigerator and cabinets made of 100 year old fir with copper insets and unique drawer pulls. The Copper Cabin Montana lodging for rent by owner is tastefully decorated with a wagon wheel chandelier, antique wardrobe and some carefully hung eclectic mirrors. This cozy Montana lodging is warmed with toasty, radiant floor heating. Guests enjoy a nice front and comfortable back deck with expansive views of Montana\'s Bridger Range, Spanish Peaks and Montana\'s broad big sky!